All businesses are being forced to go social. Are you facing internal conflict behind the firewall? This is not a post about social media marketing. I’m not here to give you hints on how to increase your friends, fans and followers. Nor will I say that it’s time for your business to “join the conversation” and I promise not to overuse the word transparency either. I believe that most brands (large and small) get it. Friends, fans and followers are important, yes. And brands increase their social equity by engaging in two-way dialogue with their constituency, yes. And transparency is key to these external engagements, yes. But there’s an underlying challenge that’s not being addressed as it should be. You see, years ago when Facebook and Twitter exploded and there was an expectation from the “social” community that brands should create blogs and communities; the brands listened. And what you’ll find today is that most brands are doing a really good job on these channels engaging with their customers. They’re listening to the conversation using social media monitoring tools such as Radian6 and Meltwater Buzz. They’re hiring community managers to empower and interact with the communities. And, while many still make minor mistakes here and there, they’re becoming more intelligent at adapting to this changing landscape. Most organizations are well on their way to becoming a social brand if they aren’t one already. Social business is not a trend; it’s a forced evolution. A social business deals with the internal transformation of an organization and addresses key factors such as organizational dynamics, culture, internal communications, governance, training, employee activation and much more. Organizations need to get smarter, acquire new technologies, intelligence, talent and motivation to become more open and transparent. They need to create processes and establish governance models that protect the organization, yet empower their employees. I’ve been fortunate to witness firsthand how organizations are evolving from businesses that merely engage in social behavior into social businesses. There’s a huge difference. 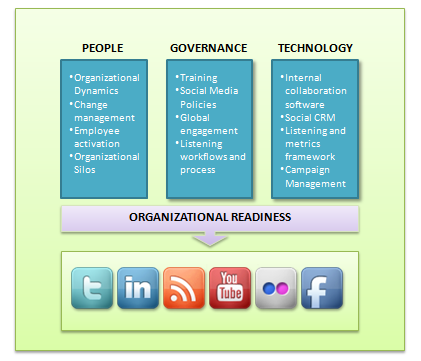 Social business is built on three pillars – people, governance and technology. The first pillar deals with the people of the organization. It addresses the need to drive organizational change in an effort to break down organizational silos and get internal teams to communicate. It’s also about activating the organization’s most import assets, its employees. The second pillar deals with governance. This simply means that organizations need to put processes in place to manage the chaos that exists from behind the firewall. Training, social media guidelines and policies are imperative for organizations to monitor and roll out across the organization within different teams and geographies. It ensures consistency; it protects the organization and at the same time, empowers its employees. The third and last pillar deals with technology. Organizations have to invest in platforms that facilitate internal collaboration. This is essential to ensure proper communication. External campaign management tools like Sprinklr are also essential to scale, especially if an organization has multiple Facebook and Twitter accounts. Social CRM plays a significant role within this pillar. My definition of social CRM is that it’s just one component that helps organizations fully evolve into a social business. It’s a strategic business initiative that considers technology, intelligence and process; so when organizations communicate with their customers they know what to say, how to say it and when to say it in order to provide a more relevant customer interaction. What’s not visible to most, unless you’ve worked in the enterprise, is the anarchy, conflict, confusion, lack of communication and organizational silos that exist behind the firewall. This makes the process of becoming a social brand much more difficult and less effective. So this quest to become a social brand and a social business is one of simultaneous effort. A study back in 2008 showed that 55% of consumers want ongoing conversations with companies and brands. The study investigated how brands and consumers interact and how consumers want brands to engage with them. And the results were awesome. In addition to the 55% of people wanting an ongoing interaction, 89% of respondents said they would feel more loyal to a brand if they were invited to take part in a feedback group. A more recent study in 2009 (you can download here) found that 85% of Americans using social media think companies should have an active presence in the social media universe. This is all really good data. However, I believe that businesses cannot and will not have effective external conversations with consumers unless they can have effective internal conversations first. And when I refer to internal conversations, I mean much more than a few monthly conference calls and a collaboration forum. Has your organization evolved into a social business? Please give us some examples in the comments box below. Michael Brito is a VP for Edelman Digital and has worked for HP, Yahoo!, and Intel. Check out his social media blog where he frequently writes about social media.